The MX-DAC is a DAC out audiophile performance but in easily accommodated size. After years of patient research and development, we are proud to launch our MX-DAC with DSD. With its technical innovation, superb technical performance and excellent build quality, the new MX DAC offers truly outstanding value for money. The MX-DAC is a tremendous performer. It has ultra low distortion, very wide bandwidth and low noise. 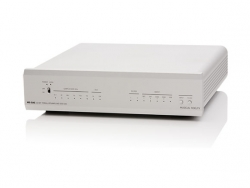 The technical performance of the MX-DAC is on a par with any other DAC at any price. Jitter is about 12pps, s/n ratio is -116dB (‘A’ weighted), linearity is +0.2dB at -116dB, stereo separation is -104dB at 1kHz, frequency response is ruler flat and distortion is 0.00025% at 1kHz and 0.0003% at 20kHz. These technical figures are state-of-the-art and show that our implementation is almost perfect, to ensure completely neutral and accurate digital-to-analogue conversion of any digital input. The MX DAC has inputs for: 2 x coax (up to 24bit 192 kHz PCM), 2 x optical (up to 24bit 192kHz PCM) and asynchronous USB up to 24bit 192 kHz PCM as well as DSD 64 and DSD 128. 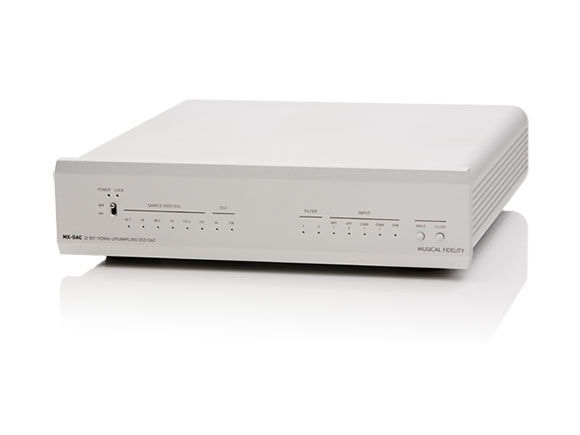 Also, all inputs whether from coax, optical or USB, are processed in the DSD domain. This desirable feature gives a warmth and humanity to the sound that simple digital conversion doesn’t achieve. The MX DAC has both single ended and balanced outputs. The new MX range has beautiful aesthetics and wonderful build quality. The front panel and housing are both from exclusive custom-made extrusions using mil-spec aluminium. Power Consumption: <0.25 Watts standby, <1 Watt max.